Orange and cardamom add warmth and cheer to the post-holiday months as part of this honey-sweetened tea ring. The tart red cranberry filling adds further sensory delight. 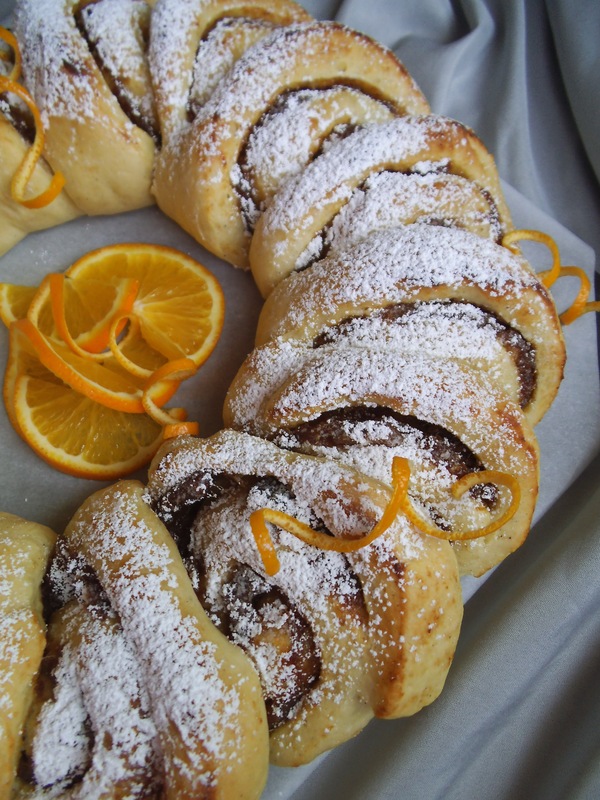 Drizzle with orange glaze for an extra special treat on a chilly day. However, I don’t like to waste food, so into the freezer went the rest. I ate the slices one by one, warming up a piece whenever I was too hungry to care about less-than-ideal filling. 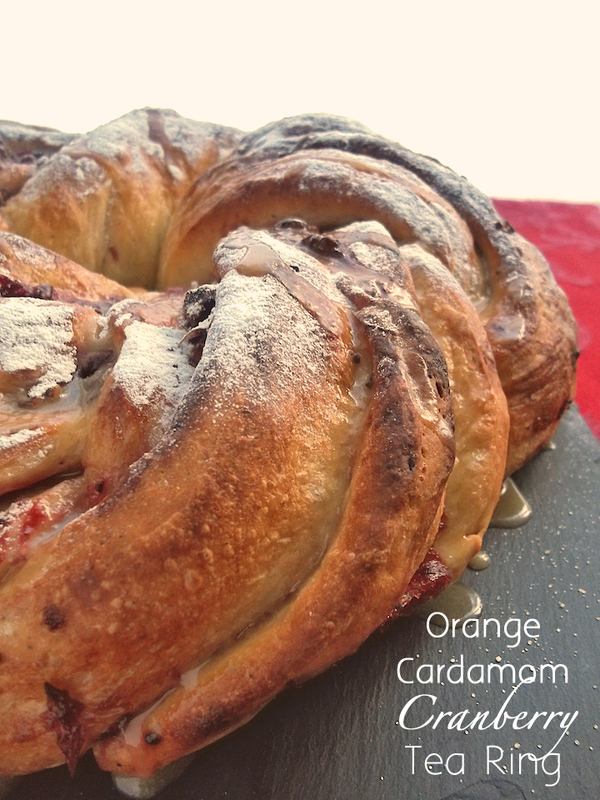 The orange cardamom bread was definitely worth repeating though. 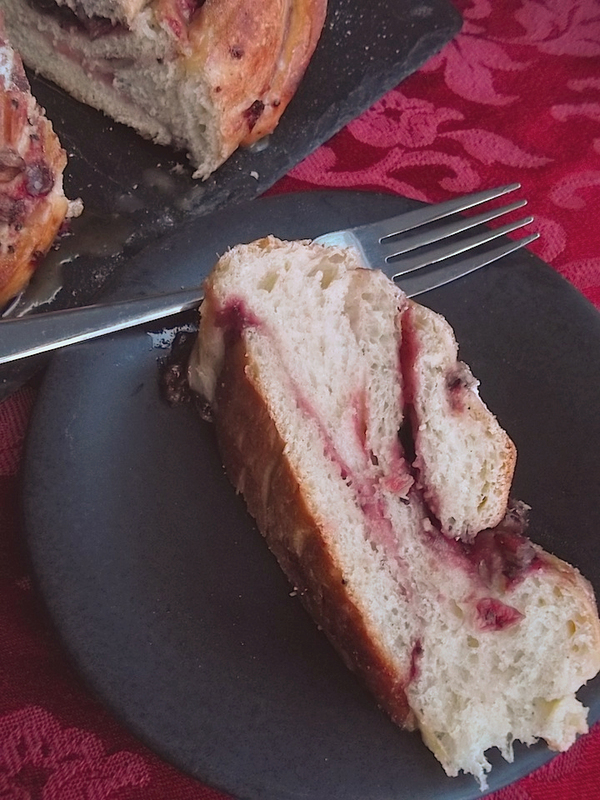 In the end, those ribbons of red cranberries tucked into fresh cardamom sweet bread tasted heavenly all the way around. Furthermore, the light orange frosting accentuated the citrus and spice notes that were baked into the bread. The final verdict: I can now heartily recommend this tea ring remake with two thumbs up! Dissolve yeast in warm water and let stand for 5 minutes. Add honey or maple syrup and melted butter (or oil). Stir in salt, followed by eggs, then flour and spices. Knead until dough is smooth, gradually add small amounts of additional flour if necessary. Place dough in a large greased bowl. Cover bowl loosely and let rise until double. Line a baking sheet with greased parchment paper. Punch down dough. Lightly flour a flat surface and spread the dough onto it to form rectangle about the size of a baking sheet. Spread the dough with butter, leaving a 1 inch (3 cm) margin on all sides. Drizzle evenly with honey, and then sprinkle with nuts. Spread cranberry sauce (or other sauce) on top. Roll up lengthwise to form a log. Cut in half lengthwise, leaving about 3 inches (8 cm) on one end uncut. Braid the two halves and then bring the ends together to form a ring. Transfer the braided ring to the parchment-lined baking sheet. Cover loosely with greased plastic wrap or a damp tea towel. Let rise a second time for 40 to 60 minutes. Preheat oven to 350 degrees F (180 C). Uncover dough and bake ring for about 50-60 minutes or until golden brown. Remove baked ring from oven and allow to cool in the pan for 10 minutes. 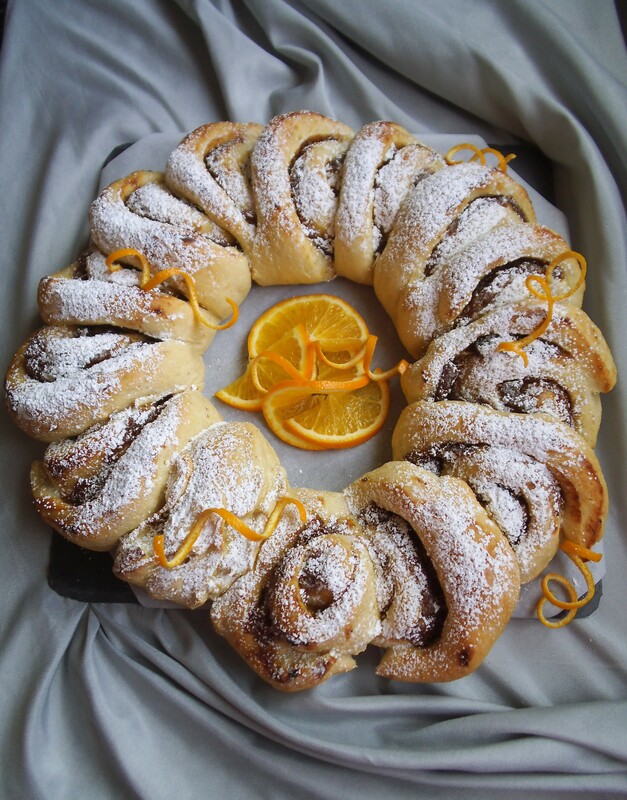 Meanwhile, prepare a thin frosting by whisking together orange juice and icing sugar. After the ring is mostly cooled, use a snipped plastic bag or small spoon to drizzle the ring with the icing. Or dust with icing sugar. Step 1: Spread with butter, honey and nuts. Step2: Spread with cranberry sauce. Step 3: Roll up and seal seam. Step 4: Cut in half lengthwise, stopping before one end. Step 5: Braid the two sides and form a circular wreath. Thank you! It’s nice to have something colourful on a plate, especially this time of year. Wow! This looks and sounds great!!!! What an absolutely gorgeous, classic tea ring! I love to see recipes like this – I KNOW it’s not good for me, but I also wouldn’t be afraid to try a slice (or two!) Some sweets/desserts are SO over the top! This recipe is sweetened with honey, so it’s not too unhealthy. I made my own cranberry sauce too, but that’s optional. 🙂 Enjoy! I’m making now for Christmas brunch and I have a question: where were the beaten eggs supposed to go? Sorry, they go with the other wet ingredients before you add the flour. I’ve edited the directions to clarify.